With nearly 2000 stitch patterns in its public collection, Stitch-Maps.com is all about creating and viewing stitch maps. But sometimes it’d be nice to connect with the person who contributed a stitch pattern: to ask a question, or make a comment, or just see what else they’ve done. This is where Ravelry comes in. Click the icon, and you’ll be taken to the contributor’s profile page on Ravelry. Click the icon, and you’ll be able to send them a message. If you’re new to Stitch-Maps.com, you’ll be asked for your Ravelry username when you register a free account. That’s all there is to it! 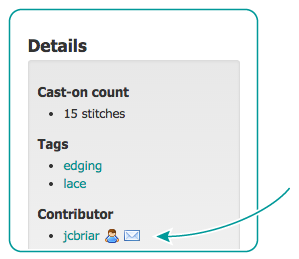 If Stitch-Maps.com knows a contributor’s Ravelry username, it’ll display the icon. If it knows your Ravelry username as well, it’ll display the icon too.